Looking for a sweet deal? 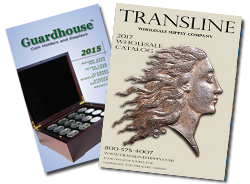 Browse Transline Supply’s Sales & Liquidations category to find dozens of products from our catalog on sale while supplies last. Check back here frequently to find the latest deals Transline has to offer. This black 2011 Global Silver Set Holder that holds the 1 oz. Australian Silver Koala, 1 oz. Chinese Panda, 1 oz. American Silver Eagle, 1 oz. British Silver Britannia, and the 1 oz. Somali Silver Elephant. No Damages, in perfect condition. Does not come with casing, only the black plastic insert. AS IS- Opposite prongs. We have a small quantity with the metal lift prongs in the opposite location to our regular stock. To be used with item 40367, 40368, and 40369 these trays allow you to make a custom display box for all coin sizes in your collection. This tray holds 30 capsules and fits size Small Guardhouse and Model A Air-Tite holders and other 31mm exterior diameter-sized coin capsules. Compatible with box style 23820 and 23840. Unlike Vinyl, Guardhouse Shield Polypropylene are 100% archival. Thinner, stronger and less susceptible to tearing and stretching. Packed in an attractive display box, 9 Pocket Guardhouse Archival pages can hold and protect 2 1/2 x 3 1/2 photographs, sport cards, gaming cards, coin slabs... At a fraction of the price! Features picture of woods in background. 2x3 frosty case with printed insert to hold 4 nickels.